Peoria, IL - It was the back end of a brief, two-game home stand for the Bradley Braves (9-7) (3-2) Sunday afternoon at Renaissance Coliseum, as the Braves took on Missouri Valley foe Missouri State (9-8) (5-1). It didn't take long for the Braves to get the scoring going, as Gabi Haack made a layup just 40 seconds into the game. The remaining 9:20 of the quarter was back and forth. After either holding the lead or the game being tied for 4:23, Bradley eventually lost the lead for the first time, when Missouri State's Liza Fruendt, named Missouri Valley Preseason Player of the Year, made her second shot of the game to put the visiting Lady Bears up 10-8 with 5:37 to go in the opening quarter. At the first media timeout at the 4:51 mark, all five Bradley starters had already reached the scoring column. The remainder of the first ten minutes saw what seemed to be a continuing theme for a majority of the game, back and forth basketball, as Bradley outscored the Bears 12-11 to end the first ten minutes, but Missouri would still hold a one-point lead after the first, 21-20. The second quarter was likely Bradley's best. The only problem, Missouri State led for almost eight minutes of the frame. Shunseere Kent and Anneke Schlueter did combine for 13 of the Braves' 21 points in the period. After being tied 35-35 with 2:44 to go in the half, the Braves would go on a 6-2 run to close out the second quarter, capped by a Kent layup with just 25 seconds until the half, and that layup would give the Braves a four point lead headed to the halftime locker room, 41-37, over the Lady Bears. To start things in the second half, Haack had her best quarter of the game, hitting two shots from behind the arc to give her six of her ten points on the game. Outside of Haack's six points, the Braves offense wasn't where it had been in the opening 20 minutes. In fact, three Braves other than Haack that scored in the third only combined for five points. Despite the cold start to the second half, Bradley would still be in this one after three quarters of play, tied with the Bears at 52-52. The Braves just couldn't pull away from the Bears in the fourth quarter. The game would only be tied on two different occasions within the quarter. The hosts would lead for 4:08 of the fourth, holding a four-point lead twice, but it didn't get any better for the Braves from there, as the Bears would take the lead for good at the 4:15 mark. 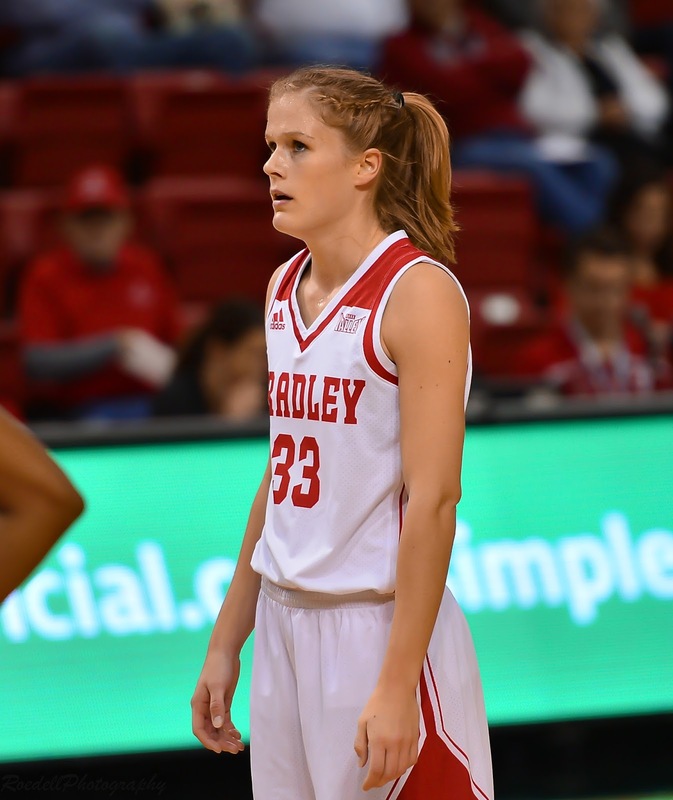 By the final buzzer, Bradley would walk away from this one with two consecutive losses, dropping Sunday's game to Missouri State by a score of 71-65. The Braves had three in double figures, those three being Anneke Schlueter (18), Gabi Haack (12), and Shunseere Kent (12). Both teams would finish the game shooting the exact same percentage from the field, 46.2%. The Bears would finish with four in double figures. After the game, Haack thought there were multiple learning experiences to take out of this one. "I learned that we needed to come out with more energy to start the game. We've been starting a little slow." Haack also thinks that the Missouri Valley Conference as a whole has left a good impression on the freshman five games into league play, saying she thinks it's "a very tough conference". Haack went on to cite a specific turning point, to a degree where things went south for good. That instance, a charge taken by Missouri State's Emily Gartner. "We kind of looked defeated, especially after there was that charge taken." Anneke Schlueter, whose 18 points just miss a career high of 23, echoed Haack in terms of when things went wrong, even comparing it with Friday's loss to Southern Illinois. "Friday, it was the first half. Today, it was the last three, four, five minutes. We have to play basketball for forty minutes and hang in there." Both Schlueter and Gabi Haack narrowly missed a double-double. Schlueter brought in nine rebounds, while Haack's 12 points were accompanied by nine rebounds as well. Head Coach Andrea Gorski believes there's a lot to take out of this one, but nothing of concern that her team may need to change. "We're taking care of the ball pretty decently. When you come and play two of the best teams in the conference, we don't have to go back to the drawing table. If we want to be in the top four teams of the conference, I think we're right there." Gorski mentioned how the atmosphere around the team was a "super focused, but mad" practice yesterday. Sunday afternoon, "there's tears in the locker room". The Braves Head Coach hopes these emotional situations will benefit the team in the long run. "I think having the sting of a couple of losses will fuel us." Schlueter, with her 18 points against Missouri State, continues a string of two consecutive games having scored in double figures, after going through a stretch of the scoring not being where it has been. The senior thinks it came down to one factor. "I attacked. Every time I don't attack in a game, I struggle. When I attack from the beginning on, my three will come, I have my self-confidence." Haack is convinced that getting back on a winning streak comes down to how they want to attack the four practices the team has leading up to Friday's game at Indiana State. As far as the 'keys to the game' for the Braves Friday, Coach Gorski said it has to do with desire. "We've got to want the win and not wait for it to come to us." Both Haack and Schlueter shared the same opinion, saying that energy both from the five on the floor and the 10 on the bench need to be good in order to get the win.